The Queen Mary was considered the grandest ocean liner ever built. From her maiden voyage in 1936 to her final voyage to Long Beach Harbor in 1967, she was the exclusive playground of choice for the world’s rich and famous, who considered her the only civilized way to travel. 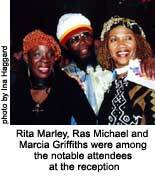 I imagine those same rich and famous (mostly white) patrons would be turning over in their graves if they could have seen the many dreadlocks, Rastas, and the multi-ethnic contingent of partygoers who attended the fabulous reception on the ship held for the opening of the “The World of Reggae featuring Bob Marley” exhibit on February 16, 2001. Featuring treasures from reggae historian Roger Steffens’ private vault, the exhibition chronicles the history of Jamaica’s number one national resource, reggae music, from its musical origins of mento and ska, to the dancehall style of today. The reception was held in the Grand Ballroom on the Grey Ghost. A no host bar greeted patrons, and tasty hors d’oeuvres from ital to decadence satisfied even the most finicky of palates. “Marley was one of the first people to put politics in music and got us to get up and stand up. Marley made being political cool, made thinking about what was happening in the world a part of a bigger consciousness. Consequently my son is named Marley,” said a skankin’ Mario Van Peebles. The set turned out to be one of the most moving performances of the Bob Marley Day Celebrations scheduled for the weekend as Kymani Marley took the stage backed by Marcia Griffiths and Judy Mowatt, with Rita Marley looking on from the audience. 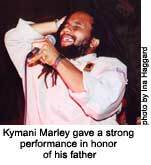 Kymani Marley, the latest of the Marley children to follow in his father’s footsteps and former deejay in the dancehalls of Miami, has a sound that sounds eerily like Bob’s. This was Kymani’s second year appearing at Bob Marley Days. His hit single “Dear Dad,” a letter to his late father, is a moving tribute from his debut album, “The Journey.” He has been featured on Shaggy’s “Midnite Lover” album, and performed the duet “Fell In Love,” with Peter Morgan of Morgan Heritage, one of the hottest young groups in Reggae. Opened January 19, 2001, the exhibit is presented by Global Treasures and designed by Curatorial Assistance of Pasadena, California. 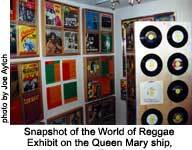 Housed in two buildings of the English Village at the Queen Mary in Long Beach, California, it features nearly 1,000 individually mounted album covers, a large number of 7″ vinyl singles, hundreds of posters, original flyers, postcards, buttons, books, magazines, banners, bumper stickers, T-shirts, medals and other memorabilia from some of reggae’s most famous figures covering 40 years of reggae. In various areas of the exhibit you will find sections honoring the late Emperor of Ethiopia Haile Selassie I, the late Emperor of Ethiopia, a section on the internationalization of reggae with items from around the world, interactive computer terminals, and a film on the life and times of Bob Marley featuring conversations with many key figures, including the Wailers, Peter Tosh, Jimmy Cliff, Bunny Wailer, and more. Next time you are in Long Beach visit “The World of Reggae” featuring Bob Marley. It’s a visual and sonic experience that will rock your world. The exhibit is on view through Sept. 30, 2001, open 7 days a week, 10am to 6pm. For more information, phone ahead: 562-435-3511 or check out the exhibit’s website: www.theworldofreggae.com.